I rec’d your letter of the 21st shortly after our return to camp and take the earliest opportunity of writing. Yes, we have been & gone and done it. Last Thursday the 16th our brigade consisting of the two Rhode Island regiments, the New York 71st and the New Hampshire 2nd took up our line of march for Fairfax Court House. We crossed Long Bridge about 3 o’clock and continued on for six miles where we bivouacked for the night. Nothing occurred of importance to disturb our slumbers except the passing of troops bound on the same expedition. We commenced our march early in the morning, the 2nd R. I. regiment taking the lead and acting as skirmishers, Co. A taking the advance on the right; Co. D acting as flankers; Co. F acting as rear advance on the right of the column, Co. K[?] acting as advance on the left. Co. C as flankers and Co. G as rear guard. I cannot state exactly the strength of our forces at the time, but should judge there were seven or eight thousand, including 1500 cavalry and two Batteries of artillery with two howitzers belonging to the New York 71st Regt. When within half a mile of the village of Fairfax, word was sent that the rebels’ battery was directly in our line of march. Our artillery was immediately ordered to the front and fired three shots into it, making the sand fly, and showing pretty conclusively that the birds had flown. All the time this was taking place your humble servant was skirting around in the woods as a skirmisher and arrived in the village ahead of the main column. As our company arrived the streets presented the scene of the wildest confusion: old negroes running around, some laughing, some crying and some swearing at a fearful rate. The streets were strewn with the knapsacks, haversacks, canteens, blankets, shirts and most every article pertaining to camp life. The houses were deserted and in some places the tables were set for dinner and coffee warm on the stove. After strolling around a short time we quartered ourselves in the park of G. Lee and made ourselves as comfortable as circumstances would permit. The cavalry in the meantime pursuing the retreating rebels and capturing 30 of their men. What particularly pleased me was that the company that lost the mess was the Palmetto Guards and Brooks Guards of South Carolina, having lost all of their camp equipage and barely escaped with their lives. But to continue, the next day our colors started for Manassas but halted and camped three miles this side of Centreville, waiting for our troops and reinforcements to come up; the second regiment being somewhat in advance of the main army; we stay here for about three days and Sunday the 21st about 2 o’clock the drums beat the assembly and in ten minutes we were on our march for Bull Run having heard the enemy were waiting to receive us, our troops then numbering 25 or 30 thousand which were divided into three columns ours under Col Hunter taking the right through a thick woods. About eleven o’clock as our pickets were advancing through the woods a volley was poured in upon them from behind a fence thickly covered with brush; the pickets after returning the shots returned to our regiment and we advanced double quick time yelling like so many devils. On our arrival into the open field I saw I should judge three or four thousand rebels retreating for a dense woods, firing as they retreated, while from another part of the woods a perfect hail storm of bullets, round shot and shell was poured upon us, tearing through our ranks and scattering death and confusion everywhere; but with a yell and a roar we charged upon them driving them again into the woods with fearful loss. In the mean time our battery came up to our support and commenced hurling destruction among the rebels. Next orders were given for us to fall back and protect our battery as the enemy were charging upon it from another quarter, and then we saw with dismay that the second R. I. regiment were the only troops in the fight; the others having lagged so far behind that we had to stand the fight alone for 30 minutes; 1100 against 7 or 8 thousand. It was afterwards ascertained from a prisoner that the rebels thought we numbered 20 or 30 thousand from the noise made by us while making the charge. While preparing to make our final effort to keep our battery out of their hands, the 1st R. I. regiment then came filing over the fence and poured a volley out to them that drove them under cover again; they were followed by the New York 71st and the New Hampshire 2nd regiments; with 2,000 regulars bringing up the rear who pitched into the “Sechers” most beautifully. Our regiments were then ordered off the field and formed a line for a support to rally on in case the rebels over powered our troops. When the line had formed again I started off for the scene of action to see how the fight was progressing. As I emerged from the woods I saw a bomb shell strike a man in the breast and literally tear him to pieces. I passed the farm house which had been appropriated for a hospital and the groans of the wounded and dying were horrible. I then descended the hill to the woods which had been occupied by the rebels at the place where the Elsworth zouaves made their charge; the bodies of the dead and dying were actually three and four deep, while in the woods where the desperate struggle had taken place between the U.S. Marines and the Louisiana zouaves, the trees were spattered with blood and the ground strewn with dead bodies. The shots flying pretty lively round me I thought best to join my regiment; as I gained the top of the hill I heard the shot and shell of our batteries had given out, not having but 130 [?] shots for each gun during the whole engagement. As we had nothing but infantry to fight against their batteries, the command was given to retreat; our cavalry not being of much use, because the rebels would not come out of the woods. The R.I. regiments, the New York 71st and the New Hampshire 2nd were drawn into a line to cover the retreat, but an officer galloped wildly into the column crying the enemy is upon us, and off they started like a flock of sheep every man for himself and the devil take the hindermost; while the rebels’ shot and shell fell like rain among our exhausted troops. As we gained the cover of the woods the stampede became even more frightful, for the baggage wagons and ambulances became entangled with the artillery and rendered the scene even more dreadful than the battle, while the plunging of the horses broke the lines of our infantry, and prevented any successful formation out of the question. The rebels being so badly cut up supposed we had gone beyond the woods to form for a fresh attack and shelled the woods for full two hours, supposing we were there, thus saving the greater part of our forces, for if they had begun an immediate attack, nothing in heaven’s name could have saved us. As we neared the bridge the rebels opened a very destructive fire upon us, mowing down our men like grass, and caused even greater confusion than before. Our artillery and baggage wagons became fouled with each other, completely blocking the bridge, while the bomb shells bursting on the bridge made it “rather unhealthy” to be around. As I crossed on my hands and knees, Capt. Smith who was crossing by my side at the same time was struck by a round shot at the same time and completely cut in two. After I crossed I started up the hill as fast as my legs could carry and passed through Centreville and continued on to Fairfax where we arrived about 10 o’clock halting about 15 minutes, then kept on to Washington where we arrived about 2 o’clock Monday noon more dead than alive, having been on our feet 36 hours without a mouthful to eat, and traveled a distance of 60 miles without twenty minutes halt. The last five miles of that march was perfect misery, none of us having scarcely strength to put one foot before the other, but I tell you the cheers we rec’d going through the streets of Washington seemed to put new life into the men for they rallied and marched to our camps and every man dropped on the ground and in one moment the greater part of them were asleep. Our loss is estimated at 1,000, but I think it greater, the rebels lost from three to five thousand. Letter from the 2d New Hampshire Regiment. Dear Brother: – I yesterday received a letter from you and sister and was very glad to hear from you. I am well, and have helped to fight one of the greatest battles ever fought in this country. I suppose that by this time you have the account of the fight and retreat of the army. We fought hard but in vain. What was the use of 25,000 or 30,000 men against 100,000? We had men enough, but they were not brought in to the field. At every point the enemy had masked batteries, and they would raise the stars and stripes or do anything to deceive out men, and that was one reason so many men were lost. But we did fight the best we could. They were commanded on the right by Johnston, on the left by Beauregard, and at noon Davis came and took command of the center. I tell you Charley it was an awful day for all of us; men with all kinds of wounds begging for water and to be taken off, but we could do these poor fellows no good, for it was all a man could do to look out for himself. Men were mowed down like grain but we did the best we could as it was. I was under the fence after the regiment left me as you know I told you in Father’s letter, that I gave out and was where the balls came like hail-stones, and the regiment had gone ahead. I was almost asleep, for I was about dead when a cannon ball came and knocked a rail off the fence over my head and sent it across the road; I thought it time to get up; so I got up and went to find my gun; I could not see the regiment and started up the hill but gave out; I got into a wagon and went up the hill; then the retreat commenced. I got a drink of whiskey or I never could have got off the field; for it was men and horses, wagons and cannon rushing all ways, the dead and wounded at every step; It was as much as a man could do to carry his body over 40 miles with nothing to drink or eat; I could have taken a good horse but I thought the forces would not all retreat and the owner might be close by, so I kept on; but I called myself a fool afterwards for not getting a horse, for I never came so near dying as at that time. I had got but three miles, I could neither swallow nor spit; I drank water much blacker than your boots. We had to drink where all above and below were washing their wounds in it, and men going through mud, blood and all. It was good. Every mud hole we came to was at once in a centre of men dying of thirst. But I am alive and that is more than many a poor fellow can say; wounded men and those that gave out were left along the road and were probably killed or taken prisoners. But a man cannot tell much about anything, after a battle, for it is all a whirl, but it did not seem so in battle; I thought I could tell everything, but cannot; I was not scared, but never should have got home if it had not been that life depended on it. I was put among the missing but have returned safe. *Likely Cpl. Joseph S. Sweatt, Co. E.
Sweatt, Joseph S. Co. E; b. Boscawen; age 17; res. Boscawen (Fisherville, now Penacook); enl. Apr. 18, ’61, for 3 mos. ; not must. in; paid by State; re-enl. May 21, ’61, for 3 yrs. ; must. in June 3, ’61, as Corp.; disch. disab. Aug. 1, ’61, Washington, D. C.
Residence Boscawen NH; a 17-year-old Student. Enlisted on 5/21/1861 at Boscawen, NH as a Corporal. On 6/3/1861 he mustered into “E” Co. NH 2nd Infantry. He was discharged for disability on 8/1/1861 at Washington, D.C.
Sources; used by Historical Data Systems, Inc. Sergeant Joseph Sawyer Sweatt, eldest son of Ira and Mary S. Sweatt, was born in the town of Boscawen, N. H., Oct. 28, 1843. He was fitted in the schools of that town and of Fisherville (now Pena cook) for the Tilton (N. H.) Seminary, which he left for the purpose of enlisting in the Second New Hampshire, a three months’ regiment. He was thus present at the First Bull Run. During the retreat he was one of the many who were lost from their regiment and was reported killed, but, at length, he found his way back to his command. 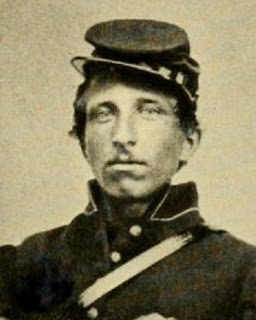 Upon his muster out he immediately joined the Second New Hampshire (three years) Volunteers, but soon after was taken sick, discharged, and sent home. A little later he went to “Woonsocket, R. I., where an uncle resided, the late Enoch Sweatt, railroad contractor, and was by him employed as an assistant civil engineer. When the call came for “three hundred thousand more,” he enlisted as an orderly sergeant in the Seventh Rhode Island. He was wounded at Fredericksburg Dec. 13, 1862, and was taken to Windmill Point Hospital, Md. There his father visited him, and, after fourteen days, was able to remove him to Washington. After a brief rest he took him home to New Hampshire, but he lived only ten days after his arrival. Yet he was very thankful to gaze once more upon familiar scenes, and to die among his friends. His final and fatal illness was typhoid fever, to which he succumbed March 6, 1863. Three older sisters survive. Dear Father: – I suppose you all think I am killed by this time, but I am not, nor much hurt. Sunday morning at 2 o’clock we started and marched to the north side of Bull Run, and it was 10 or 12 miles; we had but very little water to speak of, and we were all tired out; we got within one mile of battle-field and the bullets came fast and close; we were then put into a run, and run onto the field right in front of a masked battery which cut our ranks badly. We stood it for a short time, and then we were ordered to retreat; we went back about 100 rods and were ordered to lie down; we lay a few minutes, and then we run across the road in front of the R. I. Battery in case the enemy should charge on it, and if the bullets didn’t come fast! cannon balls, shells and grape flew as thick as hailstones. We lay close to the ground, but a good many of our men were killed. Men lay all around, some with arms and legs shot off, and all kinds of wounds you could think of. There was a cannon ball came and struck just in front of me and killed four men dead. Our Col. Was shot through the arm but he had it dressed and came on to the field again while we cheered him. Then Lieut. Col. Fisk says “My brave N. H. 2d, I have got a chance to lead you in advance, come on!” We then started down the hill, amid cannon shot and shell. We stopped under the fence and a cannon ball came and struck the top rail over my head and knocked it off. I was then so weak that I could barely walk. The regiment went up the hill on the run, and I lay in the road; but I got a drop of water and then started for the hill where we came from, for I could not see the regiment anywhere. I found a lot of N. H. boys along the road. I fir, ed every gun I could get hold of, that was loaded. When I got back, the retreat had commenced, and I suppose you can read more about that than I can tell. I made out to live through it but much as ever. I walked about 35 miles back without stopping, with mud to drink, but I will not write any more now. I was not much hurt, only hit in the arm with a spent ball, but it is most well, only lame. I have just come from Alexandria, for I lost my way and went there. I am about worn out; I believe the Fisherville boys are all safe. Letter of the 2d. New Hampshire Regiment. Messrs. Editors: I will write you a few lines this week, though not much of interest has transpired during the last few days, with, perhaps, the exception of the arrival of a paymaster in our camp, who just at this time is a very welcome visitor. To day the soldiers are being paid off, the idea of which is cheering, for many of us are getting short of change, which comes in handy even here in buying many of the smaller comforts of life with which we have been obliged to dispense with. Paying the soldiers thus promptly, seems to inspire them with new confidence and vigor, and all will fight the better for it. Sunday the 7th, Mr. Parker** preached to us from the Acts of the Apostles, chapt. 16, verse 28th – “Do thyself no harm.” The application of which he made was that all of us should act in the same spirit to each other as Paul did towards the jailor who drew his sword in despair to slay himself when he saw his prisoners about to escape. Paul had the spirit of goodness in him which he showed even then when smarting under cruelties imposed upon him by those who were his enemies. Now, he said, when far away from the kind influences of home, we should exercise the same spirit towards ourselves. This we could do in abstaining from all the trends to demoralize us, from the many vicious practices to which the most of soldiers were addicted. Take these words, he said, as a rule of life – Do thyself no harm – and a glorious reward would be ours. Now when surrounded by ten thousand temptations, it would tend to develop our strength of character. Then, he said, while he was speaking, if every fathers ear could hear his voice, he would thank him for giving his boy this advice, and every blessed mother and sister left behind, would feel it an honor for any injury that might happen to the son and brother, at the hands of any rebel, if he kept from temptation and did himself no harm. Here lies the danger, It was an excellent discourse, and left an impression on those who hear it that will not soon be forgotten. Tuesday afternoon, the regiment were favored with a speech from Gen. Wilson*** of California, a noble son of the old Granite State, who said he was proud of being here and seeing faces many of which were familiar to him. He came a son of New Hampshire to speak to New Hampshire soldiers in whom he took a great interest, though sixty-four years had taken away something of his manhood strength, still he meant to follow them in their marches and their battles, that when he returned to their native State he might tell her people how well her sons stood the trial. He had fill confidence in them. He spoke something like an hour, and was listened to with marked attention throughout. He was applauded frequently, and when he spoke of his daughter, who sat near us, as also taking a deep interest in us and of praying for our welfare, the cheers were absolutely deafening. At its close cheer upon sheer arose for the speaker, and the daughter who took such an interest in us. Gen. Wilson often visits our camp and is quite a favorite with both officers and men. Yesterday was the holy Sabbath, and how sweet to my ears would have been the sound of the village church bell; everything reminds me that I am out of New England, every voice, and face, and sound I hear (except in our own regiment) are strangers. To-day I have been led to think of this more than at any time before. I know not why it is unless it is that I have loved my native hills and voices of those with whom I have been accustomed to associate more than I ought. No this cannot be; I have loved them I hope truly, but not too well. Dear old New New Hampshire; there is no land on the face of the wide earth like her, no hills from which the fresh breezes blow sweeter, no people whose hearts are warmer or who can take the hand with a firmer grasp in token of the kind friendship so peculiar to her, though I have seen hills whose sides were not so steep and rugged, tho’ I many have seen in this southern clime men and women who may be more polished but not more refined, still my heart clings to her; she shall never be disgraced by those she had sent forth in this hour of our country’s peril to fight her battles. We can strike with a truer and firmer stroke at traitor hearts, we can sight with an aim more exact at those who seek to destroy our common country when we think what a kind mother she has been to us. God bless her! I have no doubt is said in his own heart by every one of her two thousand sons who are now in the field ready for the contest this day. We were expecting to march to-day at 1 o’clock, the time has been postponed until to-morrow at 1 when no doubt every man that can go will, for all are anxious. Where we are to go none of us know. Wherever it may be we will try to do our duty, only hoping that we may not be exposed needlessly, and everything be planned in good judgment as no doubt it will be. The whole nation has full confidence in the noble old General at the head of her armies. Yesterday, Mr. Parker preached to us from Proverbs 18th chapter and 10th verse – “The name of the Lord is a strong tower, the nations runneth into it and are safe” – and a good discourse it was too. Mr. Parker is a good man and well liked by the regiment; we hope his labors in our behalf will be productive of good as certainly they deserve to be. Since I wrote you last we have had a change in our culinary department, Austin Sanger having declined and appointed postmaster for the regiment, and a good appointment too, his place being supplied by Roberts, who understands his business – even now I hear the welcome sound i”fall in for supper”i so I must close for to-night. Tuesday morning – This morning we are told that it is sure that we are to march at 1 P. M. all are busy in making preparations for departure in rolling up their blankets &c., we are to take four days rations in our haversacks, so we think we are to have something of a march. The whole regiment are all in good spirits, singing and cheering at the prospect of having something to break the monotony of the camp life we have had for the three weeks we have been here. None are in better spirits or more anxious to go than the Goodwin Rifles. It is possible these orders may be countermanded, we hope not. Good bye for this time, you shall hear from me again. *This appears to be the date that this letter was begun. It appears to end the day on which the movement to Manassas began, July 16, 1861. ****There are four C. A. M.’s listed in the regimental roster who were in the regiment at this time (plus numerous C. M.s, no middle initial). Two were in the Goodwin Rifles, Co. B: Pvt. Charles A. Mace and Sgt. Charles A. Milton . Our Army Correspondence – – No. 5. Dear Independent: I am writing under difficulties, first, there is not table or even a board to write on, so I write on the crown of my cap holding it in my lap, as I sit leaning against a stack of guns while the sweat runs down and drops off my beard. We started from Camp Sullivan, Tuesday the 16th inst., about noon, marched to Washington where we united with the Rhode Island Regiments, 1st and 2d, and the New York 71st with several companies of regulars and the U. S. Light Artillery. We began to feel good as we field across the long bridge and came insight of the extensive earth works which cover all the heights on the Virginia side near the bridge or at any point of crossing on the river. The troops at work on the entrenchments gave us cheer after cheer as we passed them and at a quick step and with right good will we pushed on into Old Virginia. About 10 in the evening we went into camp, spread our blankets, and slept sweetly without being disturbed. The next morning we were up at the dawn, and after hard bread and meat again resumed our march. A fight was in prospect at Fairfax, and as we drew near the renowned spot we got our men in order and marched on still and quiet, without music. Soon a long line of earth works came in sight on the brow of a hill, but instead of its belching forth shot and shell upon us as we filed through the narrow valley, all was still, and the grand fortification showed itself no more belligerent than any other big pile of dirt. Soon our men were upon the works, but not a single soldier of the ten or twelve thousand said to have been at this place could be seen, all had left. In a few moments more we found ourselves in Fairfax. That renowned depot of Southern troops looked about as lonesome as the fortifications, for nothing of the human kind could be seen save a few negroes, and now and then a woman or child peaking from the windows. We passed through the grand street of the town, consisting of six or eight buildings, into the Court House yard, where we stacked arms, and the command was given, rest! Thus we found ourselves in possession of Fairfax Court House, and all without firing a gun or shedding any thing but sweat which was poured out pretty freely to be sure. The Colonel and staff took possession of the Court House and our regimental colors were planted upon the roof in the midst of prolonged shouts. We learned that the Southern troops left about two hours before our arrival. On visiting the deserted camps we found they must be left in the greatest haste, as much valuable property was left, provisions, clothing, blankets, tents, &c. The boys found revolvers and knives, a few matches, some rolls of dimes and quarters where they had been paying off &c. Nearly every one had some sort of trophy. In some places they left their breakfast all ready, table set, and the “hoe cake baked,” in other cases they had only got the dough mixed up ready for baking. – Flour meal, beef, pork, corn and other stores showed that food was abundant with the rebels. The men got so excited in the plunder of the camp that they did not respect private property as they should; where they learned any one was in the Southern interest they went in and helped themselves. As soon as the officers learned what was going on they at once stationed guards and put every man under arrest who was found plundering, and did all they could to prevent any outrage, but enough was done I fear to give us a bad name. The orders now are very strict and the greatest care is taken to have all private property respected. Thursday, the 18th, we marched from Fairfax to this point, which is about four miles from Centreville, and the same distance from Bulls Run which is the strong position of the rebels for the protection of Manassas Junction. The day we got here three companies of the Massachusetts 1st got into an ambush and were badly cut up. The Boston Fusileers, a company of one hundred and one, had but twenty-one men reported up to noon to-day, and the other two companies suffered but not so severely. There is the greatest excitement among the troops, some 60,000 being encamped within four or five miles, all they ask is orders to go on and clean them out. Old Gen. Scott come out to-day and says he shall not permit a single life to be rashly thrown away, that more lives have been lost now than we needed to take the whole of Bull Run, Manassas Gap and all. Bull Run is a very important point to the Southerners, as they get all their water for the Manassas Gap Railroad and for the use of the troops at that station, from this same Bull Run. The rebel troops are stationed in a large wood and they have batteries erected all about, and the position is very strong to hold for a short time, and cannot well be taken without a risk of considerable loss. The cars from Richmond have been run night and day of late bringing on reinforcements. It is thought that no other stand will be made after Bull Run and Manassas Gap until we get to Richmond. The troops are terribly excited, it is fearful to see men with the tiger fully aroused in them. To-morrow we expect to go in on Bull Run in some way, but nothing can be known previous to orders. Gen. Wilson (long Jim)* was here today with Hon. T. M. Edwards**. Gen. Wilson seems unable to leave us. God bless his great heart, how much I wish he was in his prime. I reckon he would not leave us as long as the war lasted. I don’t know as he will now. Our men are in good health. The climate is not going to kill us. We are all right in that direction. ***No individual named Trim is listed in the company roster, so this is likely a pseudonym.